Birthright, based in Dallas, Texas, is the product of years of ministry blended into a new beginning for each of its members. Originally formed in the early 1990's, Birthright has ministered to people all across the southern states in everything from church homecomings to state-wide conventions. In 2013, the trio added its newest member, John Graves, and a new chapter began in the ministry. Birthright's desire to reach the lost and encourage believers through the ministry of southern gospel music and their personal testimonies has given the group a renewed strength and inspiration. 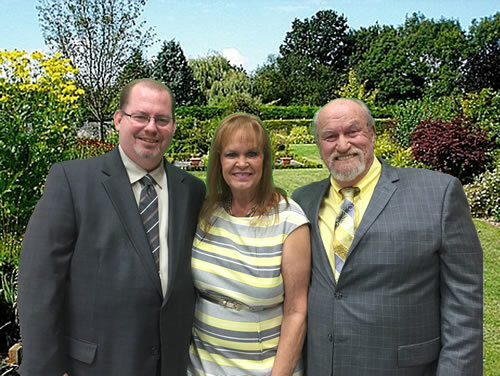 Members of the trio have ministered at many local churches, at gospel festivals and home-goings, onstage at SGM Fan Fair, and in many National Quartet Convention showcases. In 2013, all three members reignited a passion for writing Christian music, and today many of Birthright's musical selections are original music written by its members to uplift the name of Jesus Christ. Each member shares a deep love of ministry through southern gospel music. With a rich diversity in backgrounds and sounds all their own, the trio keeps audiences sitting on the edge of their seats. Birthright truly has a sound unique in today's music industry. Johnny Barber was born in Mineola, Texas, and raised in South Louisiana about thirty miles west of Baton Rouge. He began his musical career playing trombone in the band at the age of 12 and started playing piano at the age of 16. He graduated college with a Bachelor's degree in Music Education. Johnny met the Lord and surrendered to the ministry at the age of 32 at a revival meeting in Tickfaw, Louisiana, and he has been truly blessed since that time with many ministry opportunities. His extensive musical training has enabled him to play for several trio and quartet ministries through the years. He also traveled with the Peter Popoff crusades for six months, where he saw the hand of God work in many regions, including Ontario, New York, and Chicago. Johnny is the keyboard player and a vocalist for Birthright, a group he helped form in the 1990's. With his musical background and vocal ability, he continues to write and arrange music for the group. Through the Holy Spirit, Johnny continues to bless audiences across the country. Rita Barber was born in Terrell, Texas and raised in a Baptist family. She gave her heart to the Lord at the age of 16 during a service led by her father, who was pastor of the church at the time. Gospel music has been an integral part of her life since she can remember. "My earliest memories as a young child are sitting in my grandmother's lap in the choir." Since then, Rita has sung as a soloist, formed a female trio and sang with a quartet with three brothers. She has often seen God work miracles in many lives. Rita has an outstanding style of low harmony singing, developed through experience with a long line of alto singers. Her extended vocal range allows her to sing anything from low harmony to high tenor, depending on the music. In the 1990's, Rita helped form the Birthright trio, where she currently sings, writes and arranges music for the group. Her ministry goal is to follow the leadership of the Holy Spirit through prayer, testimony and music. John Graves has a rich heritage of over thirty-five years in southern gospel music. From 1974 until 1984, John sang Lead and Baritone vocals for his family quartet, the Graves Gospel Singers, as they traveled throughout the southern US. At the age of nine, John gave his life to the Lord, and at seventeen, John was called as a Music Minister to Friendship Baptist Church in Riderville, Texas, where he stayed through college. While in college, John sang with many professional organizations, including the Shreveport Chamber Singers of Shreveport, Louisiana, and the Marshall Symphony Chorus of Marshall, Texas. All through college, John continued a solo career singing a blend of contemporary Christian and southern gospel sounds. In 1994, John formed the Southern Harmony quartet of Tyler, Texas, where he continued to minister until March of 1996. In October of 2004, John helped establish the Of One Accord quartet in Frisco, Texas, where he ministered for eight years. In 2013, John joined Birthright Ministries, where he writes and arranges music and ministers vocally today. John has a sincere desire to uplift and encourage the saved and lead the lost to Christ through the ministries of southern gospel music and testimony.